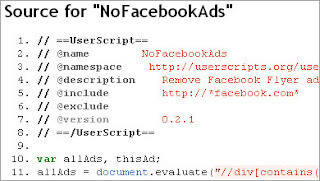 Scripts for the Greasemonkey Firefox plug-in that zap Facebook's ads: directory, Flyer Remover, Feed Ads Remover, Sponsored News Remover, and, the newest, everything-remover. There are more. Bonus: a bunch of slides (Tim O'Reilly's is the most interesting) and videos from the recent Graphing Social Patterns conference for Facebook developers. Here's a video about why Facebook is a hell to monetize.